From farm tours to unique dining experiences, wine tasting to arts and culture, the Surface Creek Valley has got a little of everything to keep you entertained! The first fruit trees in the Surface Creek Valley were planted in 1882 in Cory. Over the next decade more settlers moved into the area, and as they began harvesting they discovered that the fruit had better flavors than they had ever known. Most folks believed it was the climate that produced the mouth-watering taste, but others thought it might be something in the soil. Either way, it was not long before the first commercial apple orchards were planted north of Cedaredge in 1895. Surface Creek Valley orchardists have won many awards over the years for our mouth-watering, delectable fruit, starting with the 1893 World's Fair in Chicago. By the 1920's, Delta County was considered the Apple Capital of the world. The local fruit industry has suffered over the last century, but current orchard owners have worked hard to preserve the quality and taste of the past. Swing into one of the fruit stands and sink your teeth into the delicious apples, cherries, peaches and other seasonal fruits. Many farms offer U-pick and agritourism activities. 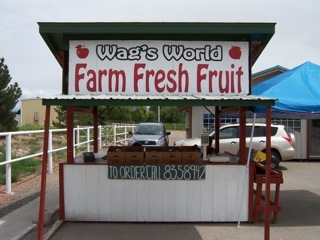 We recommend visiting the following Chamber member fruit producers!